Find Seed Potaotes around the first week of March every Spring at Prairie Gardens. Make sure to choose certified seed potatoes, which are free of insect or disease problems and have not been treated with growth retardant, unlike many potatoes in the grocery store. Luckily, each and every seed potato you’ll find at Prairie Gardens is certified. 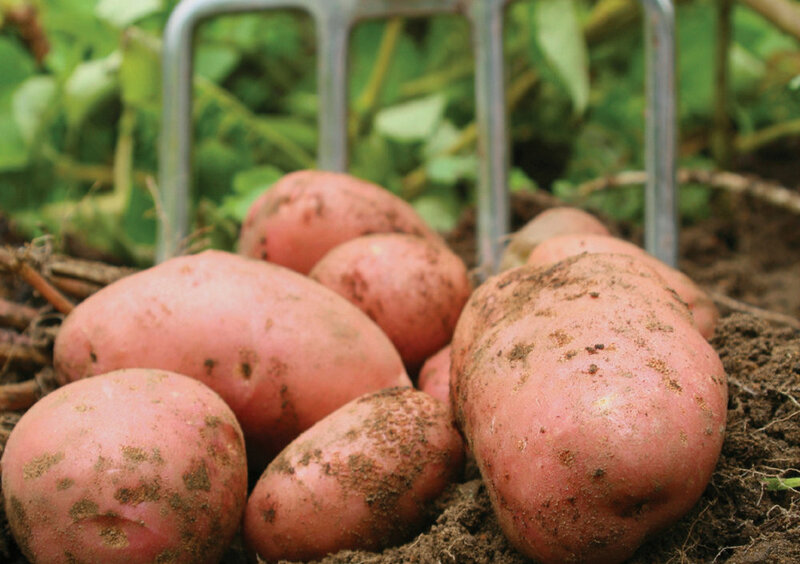 Because potatoes grow in average soil, not a great deal of preparation is needed, but adding an organic compost or 5-10-10 or 10-20-20 fertilizer is beneficial. Till or spade the soil to a depth of 10-12 inches and mix in the fertilizer into the soil prior to planting. Avoid using fresh manure or lime, as it tends to cause scab on the potatoes. If the seed potatoes are small to medium sized, plant the whole potato. If they are large sized, you can cut them in half or quarter them. Each section should have two or three ‘growth eyes’. After cutting, let the cut surface callus-over before planting them. Field Growing. Generally, the seed potatoes are planted about 12 inches apart in rows that are spaced 2 to 3 feet apart. The seed pieces are planted about 1 inch deep, then covered with additional soil as the sprouts develop. Plant cut side down. Hill or Mound Growing. Three or four pieces of potatoes are planted on a mound of soil, pulling in additional soil as the potatoes develop. Deep Planting. Plant potato pieces cut side down 12” apart and about 7-8” deep. Black or hollow centers on potatoes is often caused by over-watering. Irregular watering causes irregular shaped or knobby potatoes. As a guideline, thourougly water potatoes weekly during warmer summer weather.